The moon is the final resting ground for scads of landed and crashed spacecraft, many of which have been pinpointed recently by sleuthing scientists. Using observations by NASA's sharp-eyed Lunar Reconnaissance Orbiter, for example, researchers have located and imaged Apollo moon landing leftovers, old Soviet-era spacecraft and, more recently, the impact locales of NASA's twin Grail spacecraft that were deliberately driven into a mountain near the moon's north pole. "We are still looking for [the Soviet Union's] Luna 9 and 13," said Jeff Plescia, a space scientist at the The Johns Hopkins University's Applied Physics Laboratory in Laurel, Md. "Those were the small 'beach ball' shaped spacecraft," Plescia told SPACE.com "The beach ball might be hard to find, but it made a descent on a larger vehicle which then popped the beach ball off." This close-up image of the lunar surface was relayed on Feb. 3, 1966 from the former Soviet Union’s Luna 9 lander in the Oceanus Procellarum. This is the first image from the surface of the moon. Plescia said he had assumed that it would be possible to find the landing sites of Luna 9 and 13 by spotting albedo marks — a change in the lunar surface brightness made by their descent engines. Plescia is joined in the hunt by Mark Robinson of Arizona State University, principal investigator for the Lunar Reconnaissance Orbiter Camera, or LROC. "We've both looked, but no luck so far." Plescia said. "Given that we have found the impact sites from Grail, you would think we could find those craters, but, again, no luck so far," Plescia said. These, like the craters made by the third stage of NASA's Saturn V moon rocket, "are important to locate to understand how large a crater was made and to have precise coordinates so that the old Apollo era crustal velocity measurements can be reanalyzed." Scientists hope to find several other lost lunar spacecraft, including NASA's Surveyor 4. Controllers lost contact with this unmanned probe during its descent to the moon on July 14, 1967. "There are two options," Plescia said. "It completely failed and then just crashed, which would have formed a crater, or it just lost communications and continued to operate and landed. In the latter case, the spacecraft would be on the surface in one piece. The two potential sites have different locations. I made some preliminary searches a while ago, but need to finish it up." 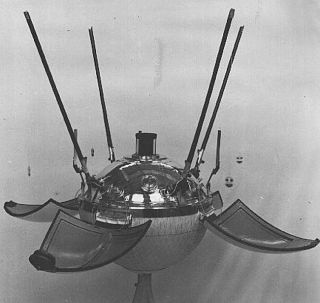 Also on Plescia's to-do list is searching for Luna 18, a 1971 Soviet sample-return mission that failed. Again, communications were lost; it may have landed safely or crashed. Craters from various fallen orbiters are possible targets as well. The holes gouged out by older missions may prove impossible to find. But coordinates exist for probes such as Europe's SMART 1 and Japan's Kaguya, but no serious search has been mounted yet, Plescia said. "For Grail it was easy, because we had before and after images, so it was easy to spot the change," he said. Why all the focus on moon junk? "There may be several kinds of value here," said Philip Stooke, associate professor in the Department of Geography at the University of Western Ontario in Canada. "One is a detective story," he said, stressing that images may help resolve the fates of failed spacecraft. One good example is the Soviet Union's Luna 23, which made it to the moon and transmitted for several days in 1974 but failed to collect a sample and return it to Earth as planned. "At the time people said it landed hard and damaged its sample drill. Now people are suggesting it fell on its side, and the LRO images seem to support that idea," Stooke said. "Did NASA's Surveyor 4 fail before or after landing? If we could find it, which has not been done as yet, we could distinguish between an intact lander and a debris field." A second value has to do with protecting "heritage" sites, especially if the teams participating in the Google Lunar X Prize — which has spurred a privately funded robotic race to the moon — get to some of these sites, Stooke told SPACE.com. "We already know plenty about the locations of Apollo spacecraft, but other targets might be difficult to find," Stooke said. "If somebody wanted to land near the former Soviet Union's Luna 9 they couldn't, because we don't know where it is." "If the site could be found in LROC images," he added, "not only do we know where it is, but a heritage protection plan can be designed." For example, the plan could call for touching down miles away, so a landing mishap wouldn't accidentally destroy an old spacecraft. A rover could then drive up to inspect the lander and its nearby descent stage, Stooke said. "So that would apply to Surveyor 4 as well, and objects like India's Chandrayaan Moon Impact Probe near the south pole," he said. Lastly, Stooke admitted to perhaps a selfish reason to look for lost mooncraft. "It is because I'm a cartographer. It is satisfying simply to be able to put a point on a map and say, 'That's where it is.' Ultimately, whatever else happens in space exploration, we should be able to document this aspect of human endeavor in which we have invested so much," Stooke said.